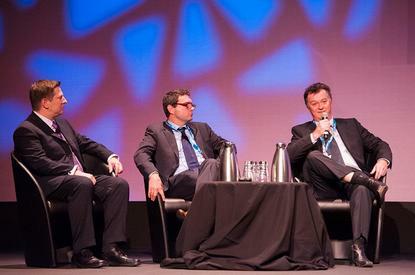 Endeavour Energy CIO, Ian Robinson, (right) speaking at CA Expo 2012 in Sydney. Also on the panel was CA Technologies global presales vice president, Trevor A.Bunker, and Visa Asia Pacific director of eCommerce, Justin Roche. Meeting the needs of users while balancing security and budget needs will help chief information officers stay relevant in the future, according to a CIO. Speaking at the recent CA Summit 2012 in Sydney, Endeavour Energy CIO, Ian Robinson, outlined to delegates his IT strategy for the New South Wales-based electricity distributor. According to Robinson, he was approaching IT agility in three steps. NSW State Premier, Barry O’Farrell, announced in March 2012 that the three NSW electricity distributors, Endeavour Energy, Ausgrid and Essential Energy would be amalgamated with the loss of 780 jobs. Due to this amalgamation, Robinson said that the three company's IT departments needed to try and find operational synergies. “That includes making our [IT] infrastructures a lot more flexible, rationalising our applications and finding new ways to work with service providers,” he said. The second step for Robinson was driving down cost. “Our business is looking at a eco system approach where instead of traditionally having our own field staff, we are now looking at partners and outsourcing of construction and maintenance work,” he said. The third step is involving non-IT staff, such as engineers, with discussions on innovations such as smart grids. “The people who operate the network, such as engineers, are starting to think in terms of operating a smart grid and how we get the information from the devices in the network,” he said. Robinson acknowledged that bring your own device (BYOD) is inevitable. He said that Endeavour Energy’s field workers, who traditionally used a clip board, were now allowed to use devices on the company network. “Consumerisation [of IT] means users have the power to buy a device on a cheap contract,” he said. “BYOD means we have been able to drive out cost by identifying ways to remove things that are no longer needed,” he said. While the company was allowing BYOD, Robinson added that he had an obligation to ensure that customer data, reliability and sustainability of networks was maintained. “Security is always at the forefront but I think people need to identity what are the most critical risks and not get into mindless levels of detail about all the whitepapers you can read about [on] the threat landscape,” he said.